managers given the significant public health concerns from this bloom. called paralytic shellfish poisoning, or PSP. the Institution’s research vessel Oceanus was the first in a five-year COHH study of harmful algal blooms and their genetic diversity across the Gulf of Maine. the Institution’s Coastal Ocean Institute. updating the model as new data was received. 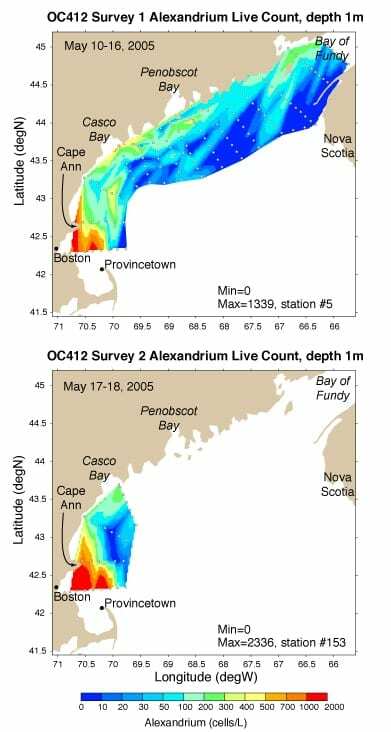 identify and count the Alexandrium fundyense cells, the shipboard team confirmed that toxic cells were indeed present in the Bay, and in waters to the immediate north. 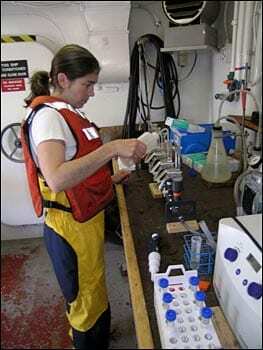 sampling into areas that are not typically monitored. in the Bay 12 years ago, and much more widespread,” added Anderson. can lead to optimum growth of Alexandrium cells. will affect the bloom is unknown. arrays, providing early warning of red tide cells and toxins. Health Sciences (NIEHS), one of the National Institutes of Health. 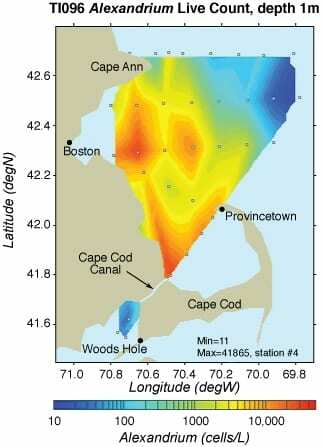 in coastal waters and estuaries that cause human illness and death.